Todd Helton established himself as the face of the Colorado Rockies over the course of his seventeen-year career spent entirely with that one franchise. The longtime All-Star first baseman had a long run of great cards from the mid-1990s until the end of his playing career in 2013, and beyond into his retirement. Collectors looking to add Todd Helton cards to their collection have many choices between his different rookie cards, autographs, relics, and even base cards. Even better, prices are normally quite low. Helton's first splash with popularity in the sports world came in the 1990s while he was briefly the starting quarterback at the University of Tennessee ahead of Peyton Manning. Eventually, the Knoxville native would turn his attention to baseball after being selected by the Rockies in the first round of the 1995 MLB Draft. 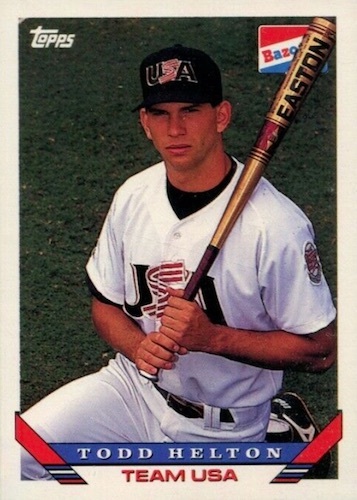 Since Helton played on the USA Baseball Collegiate National Team, his first baseball cards were made prior to him being drafted, appearing in two different 1993 sets. As a high draft pick who had already built up some popularity as a two-sport star in college, some of his pre-rookie and early cards have long been popular with collectors. Helton earned his reputation as a premier player early in his career, which led to card companies adding him to the checklists of their most popular products, along with producing numerous autographed and relic cards of the Rockies great. 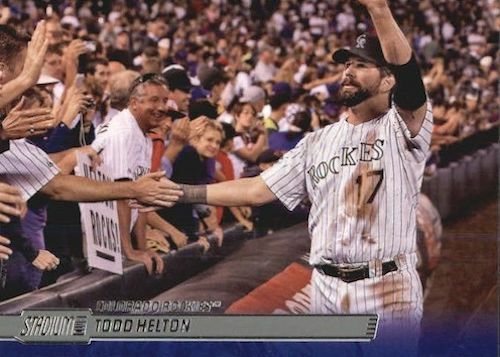 See the Todd Helton cards with the most bids on eBay. 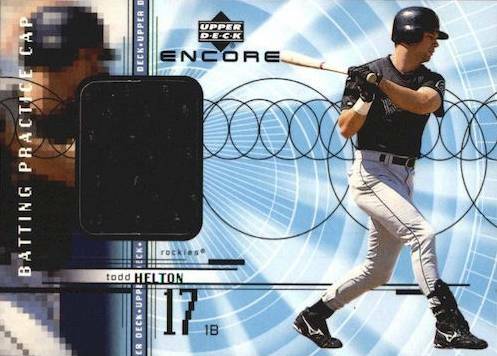 While Helton has retired from the game of baseball, his cards still remain popular. There are many great cards from his playing days that offer plenty of challenges, but card companies have slowly added him into current sets, as well. The list below looks at some of the key Todd Helton cards. These 10 cards offer a glimpse into the very best options available to collectors. This includes his top pre-rookie cards, several more from iconic sets produced during his career, and even a few cards from post-retirement years. Before the Rockies final homestand of the 2013 season, the seasoned first baseman announced that he was retiring. This allowed the team the chance to have a grand on-field ceremony to celebrate Helton’s time in Denver. Topps even made several different cards to commemorate his last game at Coors Field. The most popular option amongst collectors has been his 2014 Stadium Club card, which was part of the brand's relaunch after a brief hiatus. Known for its great photography, Stadium Club captured Helton’s acknowledgment of the crowd at the end of his final home game, seemingly the perfect way to end his run of cards as an active player. The original Topps Tek set from 1998 is one of the ultimate player collector releases. There are a grand total of 90 cards in the product, with each card having 90 different patterns, or variations. The backs of each card are double-numbered with both a card number and a pattern number. That’s 8,100 different cards. Throw in a Diffractor parallel for each card in the set and the possibilities are nearly endless. 1998 Topps Tek is an affordable Topps Helton card that offers a unique challenge. However, collectors will likely require more patience than money. The relic cards in many 1990s Upper Deck sets were a little bit harder to find than current options. UD Encore, which was a partial reprint of the regular Upper Deck set with a holographic surface, offered collectors a checklist of just 15 player’s batting practice caps, but at the rate of 1:750 packs. Some of the more recent Todd Helton relic cards feature patch pieces and low serial numbers, but this card also offers scarcity, while also giving collectors a chance to own a unique relic not often used by manufacturers. Topps first produced a set of their Chrome MLB brand in 1996. 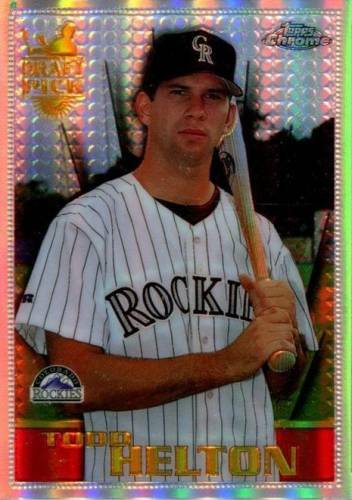 While this is not a Todd Helton rookie card, it is a very popular card from early in his career, and one of the first cards that featured the Rockies great in the team’s uniform. The 1996 Refractor cards averaged only two per box, making it one of his tougher cards from this period. 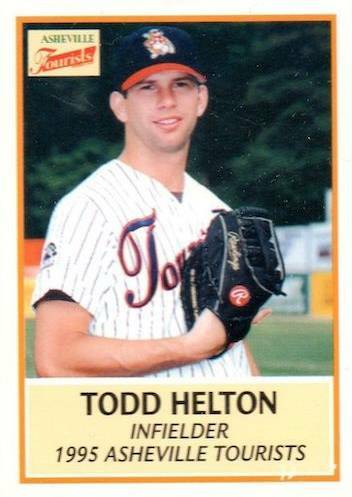 One cannot have a complete collection of Todd Helton cards without throwing in something commemorating his time at the University of Tennessee. He is obviously remembered by many for being ahead of Peyton Manning on the football team’s depth chart at quarterback for a time, but he was also a special player on the diamond too, setting several school hitting and pitching records. Panini has produced some college baseball cards in recent years and even managed to put a Todd Helton autograph into the University of Tennessee blaster boxes. He also has a signed Vols card in 2016 Flawless and 2016 Immaculate Collegiate Baseball, making for a pretty stacked year. 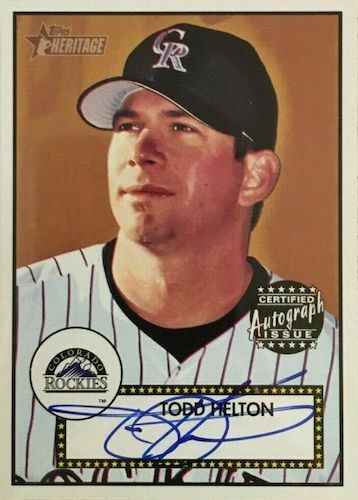 Helton’s first MLB-certified autograph rolled out the same season that he made his way onto the Rockies roster. Luckily for card collectors, Donruss released Signature Series later in the fall, allowing Helton to be included as a signer. Like all autographs in this product, collectors have a choice between Helton’s base autograph, which is not serial numbered and features a red background, his Millennium Marks autograph, which has a green background and is limited to 1,000 copies, and his Century Marks autograph with just 100 copies and a blue background. He also signed for 1998 Donruss Signature Series Baseball. The Tourists are one of the longest-running minor league teams and have plenty of marquee names in their past. This includes Hall of Famers Eddie Murray, Craig Biggio, and Willie Stargell. Helton has also established himself as part of that elite alumni group. Helton played for the Tourists in 1995 during his first stop as a pro. There are several pre-rookies of Helton available to collectors, but the 1995 team card is one of his most popular. The Tourists issued two different sets during the '95 season, with Helton appearing in the Update product. This early card can be found both as a single and attached to the team set. Topps has done a great job with Heritage year in and year out, but the original 2001 set is still one of the best in the opinion of many collectors. Based on the always-popular 1952 Topps, the premiere Heritage issue features all the usual hallmarks with plenty of variations, short prints, and a great lineup of signers. Todd Helton is part of the deep autograph checklist that also features Hall of Famers Willie Mays, Chipper Jones, and Barry Bonds. While there are many Todd Helton autographs from the period, this card stands above the rest from the standpoint of aesthetics and being connected to one of the best sets from this era of baseball cards. Beyond his base autograph, there is also a red ink copy of this card with a print run of just 52 copies. 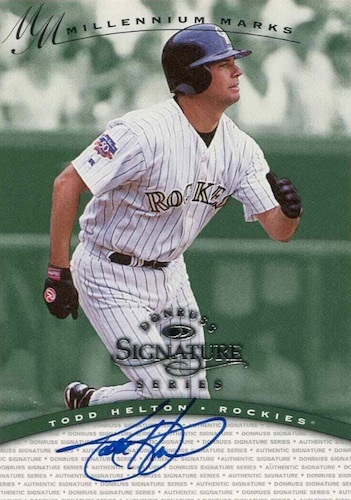 If you have trouble find his original Heritage autograph, there are many other Todd Helton autographs out there. The Topps Traded releases have long been pursued by collectors. Oscar Gamble’s legendary 1976 Traded card is a great reminder of the early success of the brand. However, Traded’s lasting popularity has really become defined by key rookies of players like Cal Ripken, and more recently Mike Trout (in Update Series). Todd Helton’s rookie is found in the 1993 edition, which was released when Topps Traded was still being sold as a factory set. 1993 Traded is known for Helton’s USA Baseball card, but is also buoyed by Mike Piazza's first standalone Topps card, along with cards featuring Barry Bonds and Greg Maddux on new teams. 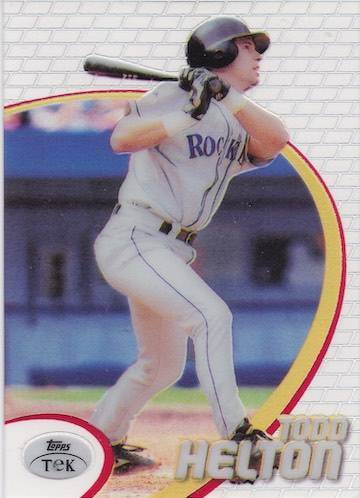 The Todd Helton Bazooka rookie card has a nearly identical appearance to his popular 1993 Topps Traded version, except for the little Bazooka logo in the top right-hand corner. Despite their similarities, there is another significant difference between the two cards—print run. 1993 Bazooka featured just 22 USA Baseball cards that were sold as a complete set via tins of Bazooka bubble gum. There has never been a definitive number placed on the quantity produced by Topps, but based on the price and population of graded cards, it is low for this period of time. Amongst Helton collectors, this card is the gold standard, and its price can be exponentially higher than the base Topps Traded rookie.